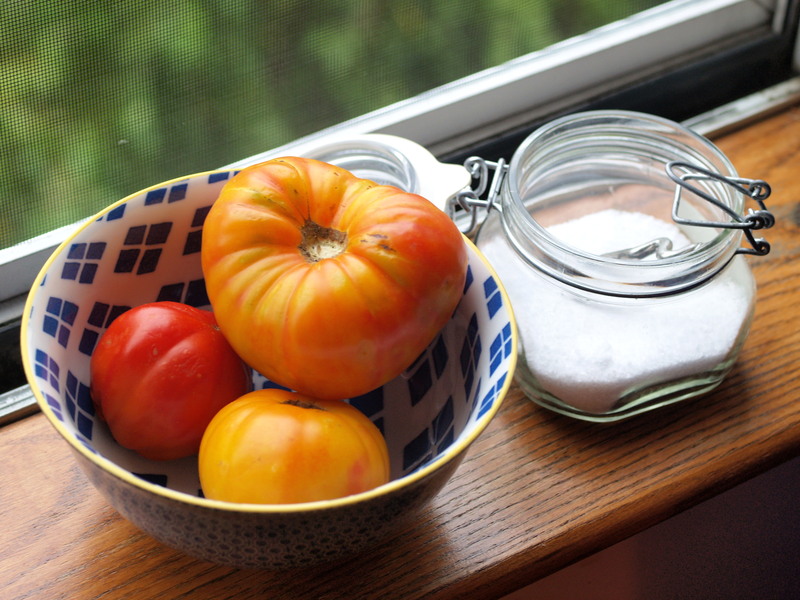 So, while you hunt from market to market, farmer to farmer, for the last of the season, eaten like an apple with a sprinkle of salt, I have some ideas for tomatoes during the winter. 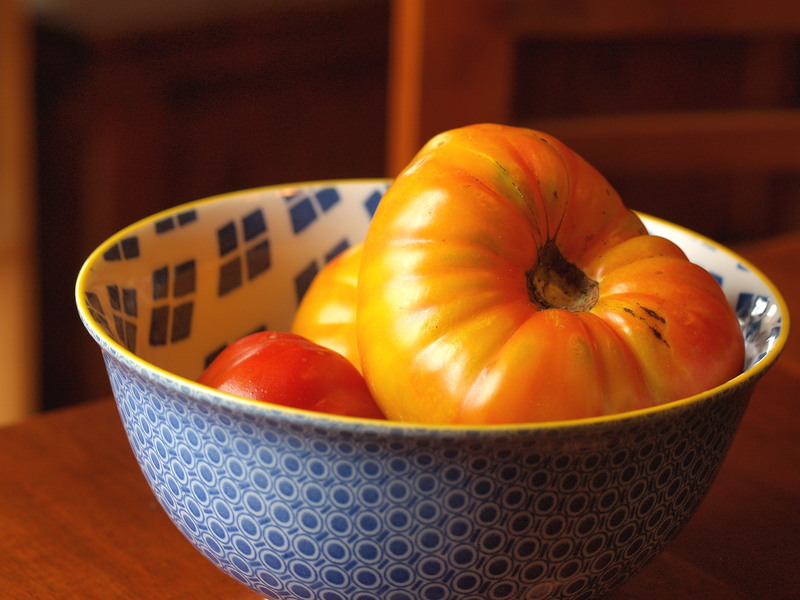 What else can you cook with tomatoes in the winter? Well, there’s always tomato sauce. Grab a bunch of plum tomatoes, also a decent option when the weather turns chilly, and get peeling. 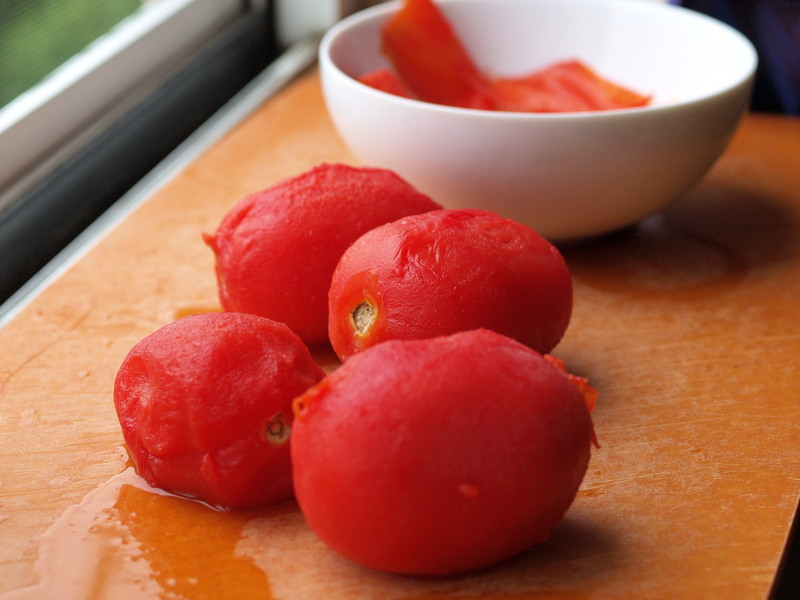 I’ve always found tomato peeling a bit fussy – boiling water, slicing an X in the tomato’s bottom, dropping it in the water, waiting a few seconds, fishing it out, plunging it into ice water, waiting for it to cool, and then peeling the slippery fella. Lucky for you, I found a tomato trick: freeze the tomatoes until hard (a few hours), take them out and let them defrost until you can handle them (about 10 minutes) and the skins just slip off. When frozen, the liquid in the tomatoes expands (like an ice cube) — you can actually see the tomato skin stretch until it splits — and then contracts as it warms, leaving behind wrinkly skin too big for the shrinking tomato. Cool, no? Of course, when your grocery store fails you, just turn to a can. 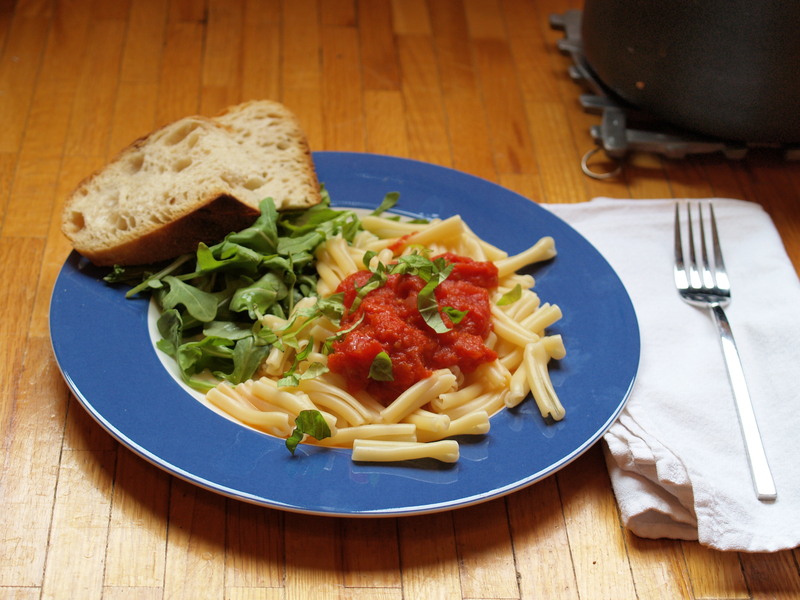 In this realm, San Marzano tomatoes are the best for whatever you want to make. 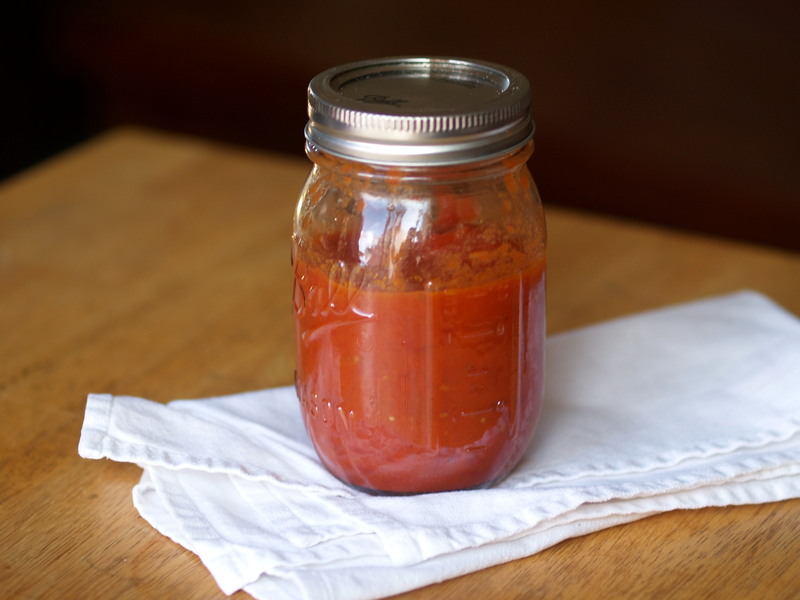 And if it’s tomato sauce you’re after, Marcella Hazan’s recipe is the way to to. It has been circulating for years; I only discovered it last week — I’ve missed a few other bandwagons in my time — but I’ve been making up for lost time here, with three batches already under my belt. Here’s the deal. Crack open a can of tomatoes. Empty it into a saucepan with an onion and a few pats of butter. Simmer for nearly an hour. When fat droplets form at the surface, it’s ready. Fish out the onion and eat it if you’d like. Sprinkle the sauce with salt to taste, but don’t taste your way to the bottom of the pan. A little pepper, maybe a dust of parmesan, a scatter of basil, and you’re ready to top (drown?) some pasta. If you have any sauce left, store it in the fridge. It’ll be gone in a few days. This recipe is all over the internet – the version I used is on Food52. The butter in the sauce provides just the right amount of indulgent cream and sweetness. Crush. With your hands, crush the tomatoes into small chunks. Simmer. Peel the onion and cut it in half. 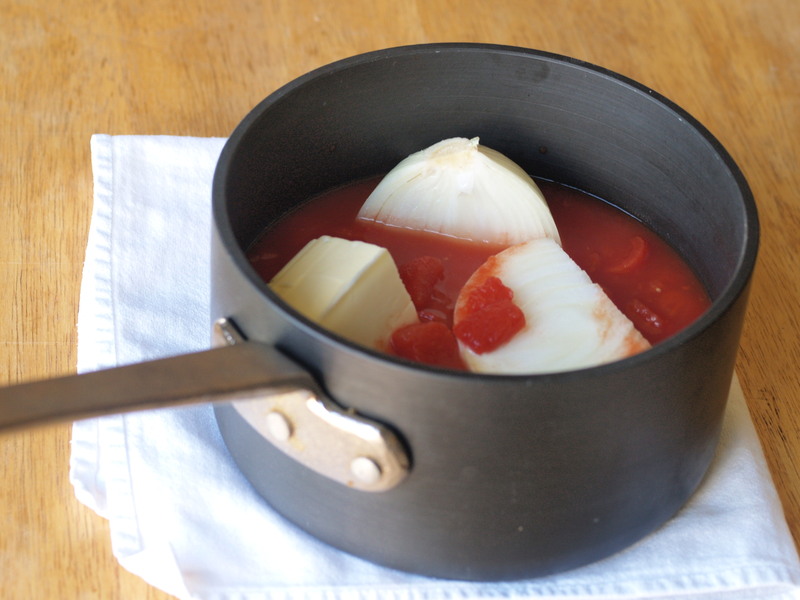 Mix in a saucepan the crushed tomatoes, onion, and butter, and bring to a simmer. 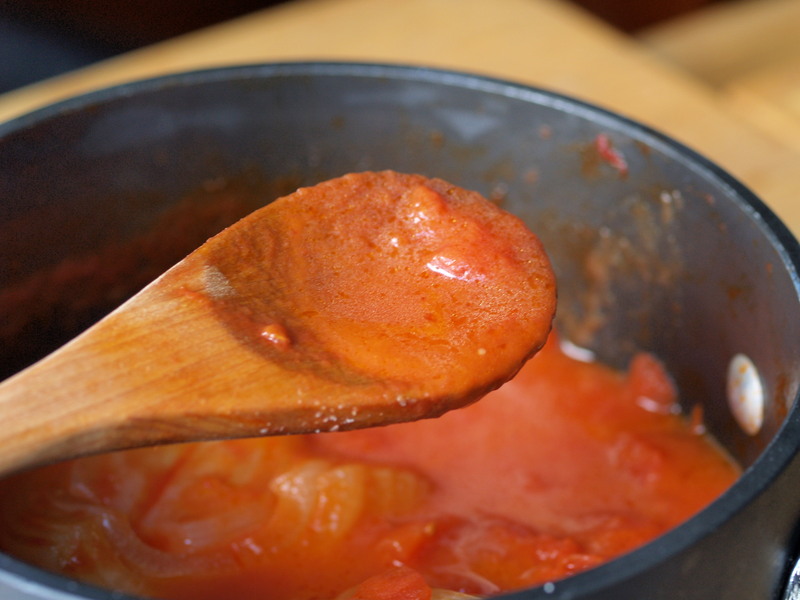 Continue to simmer over low heat, stirring every once in a while and breaking up any remaining large tomato chunks into bite-sized bits with the back of a wooden spoon. The sauce is ready when bright red fat droplets rise to the surface. Taste. Add salt and pepper to taste. Another excellent article with a twist (or turn) along with great natural pictures! Sounds bloody delicious can’t wait to try it!